The bluebells have been out for a few days now, but this morning was the first time I have heard a cuckoo this Spring: it is official now. The bird nesting seems to have been a bit erratic this year with the weather going warm-cold-warm-cold, but there do seem to be fledgeling blackbirds in the garden which is nice. I had worried the blackbirds were planning to nest in the Jostaberry again this year; they would be a bit exposed though as I cut it down to a stump at the end of the summer. 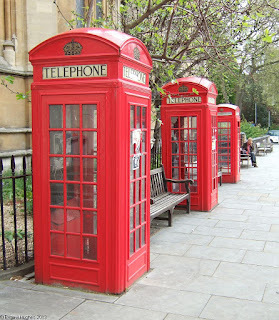 While walking around London this morning, I noticed not one, but three red telephone boxes, vanishing into both the distance and the past. As I was considering the best angle to take the picture from, a lady sat down on the bench, and started talking on her phone. 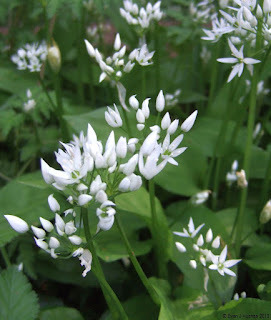 The wild garlic is flowering well now. The bright white flowers against the dramatic green foliage is always quite some sight. As a plant, wild garlic can 'interest' many of the senses; the sharp colours, the 'vibrant' smell and the 'culinary' taste are all rather intense. There is very little that is subtle about the plant. 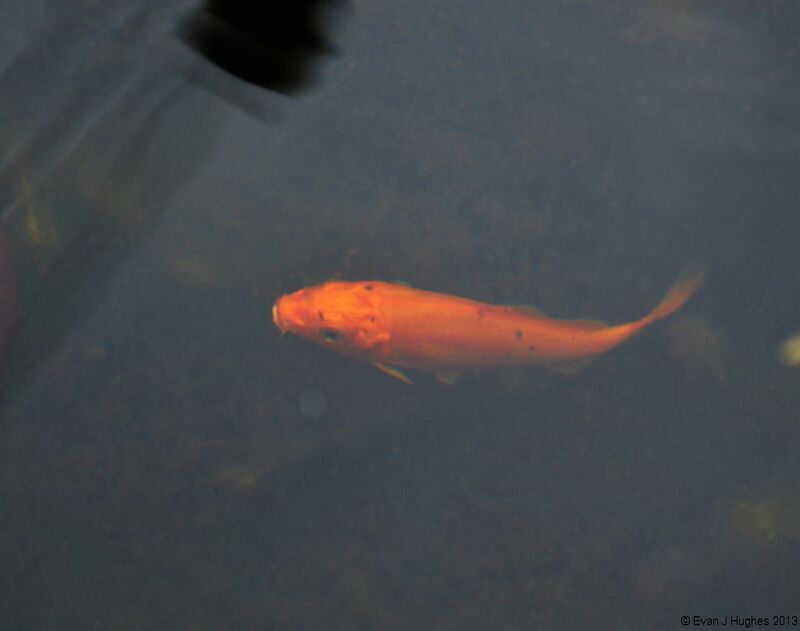 To add a little sparkle to the pond (and also hopefully to eat some of the weed), 4 Koi carp were sploshed in today. I am not sure what the fishs' chances are, but if any Herons visit, I shall have to resist the urge to take their picture before I chase them away. 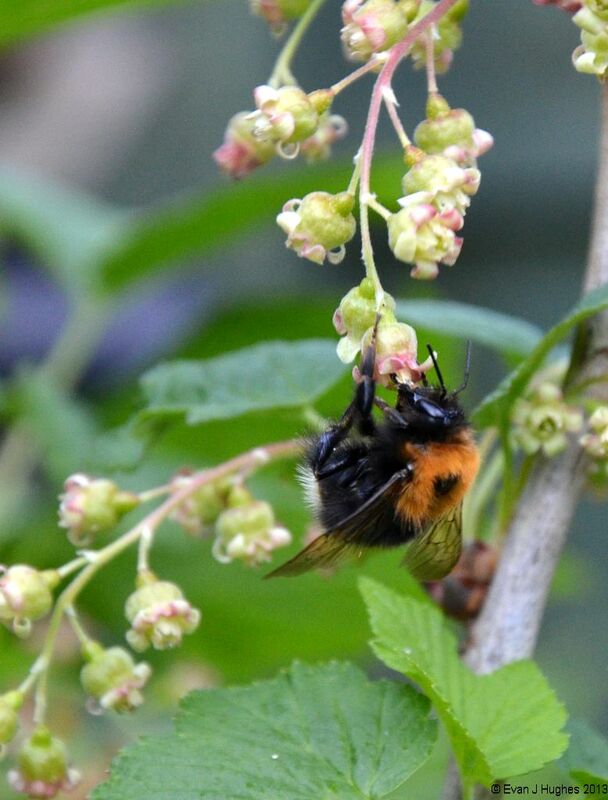 Large Bumble Bee on Blackcurrant flower. I saw this bumble bee making its way through the flowers on the blackcurrant bush this afternoon. The size of the bee was so disproportionate to the flowers, it looked almost comical; as the bee landed on this flower and stopped flapping its wings, the end of the branch bent down with the extra weight! I hope it managed to get a good feed, and most importantly, help to give me a good crop of black currants this year. The Camelia is rather late this year like everything else, but is flowering very well. It usually comes into flower for our wedding aniversary at the begining of April, but was not even ready for my birthday this year! 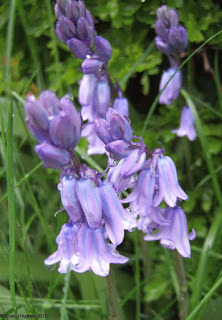 The wind is quite fierce today unfortunately so hopefully the blooms will not get smashed too soon. I photographed this same post in April last year. Back then the post was far more visible. The ivy has taken over now and seems to have enjoyed the wet 2012! I captured the cherry blossom last year, so thought the Apple tree would make a good subject this time. The tree is of a variety called 'Katie'; rather pretty methinks. In another visit to London today, I had to surface at London Bridge underground station and was taken aback by the monolithic frontage of The Shard. It is only when you walk down the street some way can you appreciate the sheer scale of the building. One day I may pluck up the courage to go up to the top, vertigo willing. On our way back from Sheffield today we stopped off at Hardwick Hall. Although originally owned by the same family as Chatsworth, it has a very different feel to it. The interior of the building is breathtaking with the most vast collection of hanging tapestries I have ever seen. Again, well worth a visit. We visited Chatsworth House today. I was lucky enough to have a brief visit a few months ago, but this time we all went and had the day there. The building and furnishings are very spectacular, and as it was Bank Holiday weekend, they also had all the water features running. It was also nice that they have a very refreshing attitude towards photography; as long as you do not use flash, then they actively encourage it. Well worth a visit if you get the chance. There is a saying about rolling stones and moss. I just liked the forms of these stones really! Flowering currant in bloom at last. I started my blog last year with a picture of the flowering currant in full bloom. Spring this year seems to be running about a month behind for many flowers; hopefully we will get a summer instead! While waiting for my flight back home this evening, I made the mistake of watching the other planes taking off and landing. This plane was rather wobbly coming in and did not have a very smooth landing. I wondered if it was a trainee pilot and looked for the 'L' plates as he taxied in. It looks as if he had an excuse though; only one engine was running, the propellor on the right of the image was feathered and stationary! While walking along Rose Street in Edinburgh this evening on my way to a restaurant, I spotted this lonely bottle of water sitting on a chair. The peeling paint on the wall behind reminded me of another chair picture by Van Gogh. I am not planning on giving my ears a trim any day soon however. then wince and cross my legs as my eyes started to water at the thought. There is a fantastic fudge shop on the Royal Mile here in Edinburgh. The smell of sugar and pure stickiness is too overpowering for me to go into the shop for anything but a fleeting purchase, so I have to resort to staring through the window at the delights inside. Today is World Pinhole Photography Day! I took a number of pictures on film, but have not had a chance to develop them yet. As a backup, I put a body-cap on the camera that has a triangular pinhole made from paper in it. The weather is cloudy and dull, but at least it is not raining like last year. EDIT: As I was travelling to Edinburgh on WPPD, I managed a variety of not terribly good images! The best was captured while I was at Gatwick waiting for my flight and I submitted it to the WPPD site here. This week has been rather manic as I have been doing sound and lights for the local production of Oliver! The stage was set as a 3/4 configuration with the audience on 3 sides. It has been a tricky show to rig the lights and sound for, but it all went really well in the end and the actors were superb. Being teetotal does mean that it is all down to Jo to make sure at least some alcohol gets consumed in the household. With busy lives however, the bottles gather dust and are more likely to be used in cooking. I suspect the bottles are in for a shock when Liz and her friends turn 18 in a few years! Not the best picture today, but it looked to me like a goose poking its head through the soil. Fingers crossed for some nice courgettes though later in the year. 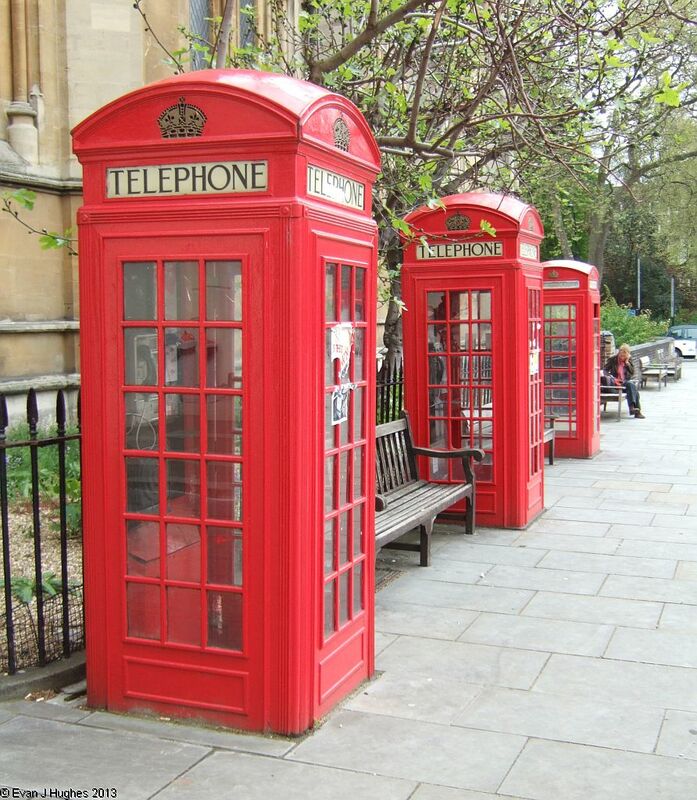 A trip into London today is always entertaining; watching everyone else run around as if time is running faster in the capital than elsewhere. Railings are rare in the UK after they were cut down for metal in WW2; the sight of some remaining is always welcome. There are globs of slippy jelly at the bottom of the pond today that look rather like frog spawn. There is not much of it so I am not holding any hope, but fingers crossed. The recent rain and warming of the weather has also brought many slimy creatures out of hibernation too; this snail was looking rather hungry. I find myself typing regularly these days (including for my blog), however my 'memory' relies on my log books and ink. There are few luxuries in life, but one is having a decent pen to write with. I wonder about the future for many of todays youth who type with their thumbs on their phones and if they do put pen to paper, it is probably a plastic disposable instrument they are using.